Having a good employer branding strategy is integral not only for smaller, growing companies, but also – and perhaps especially – for global companies who have already established their names in the market. 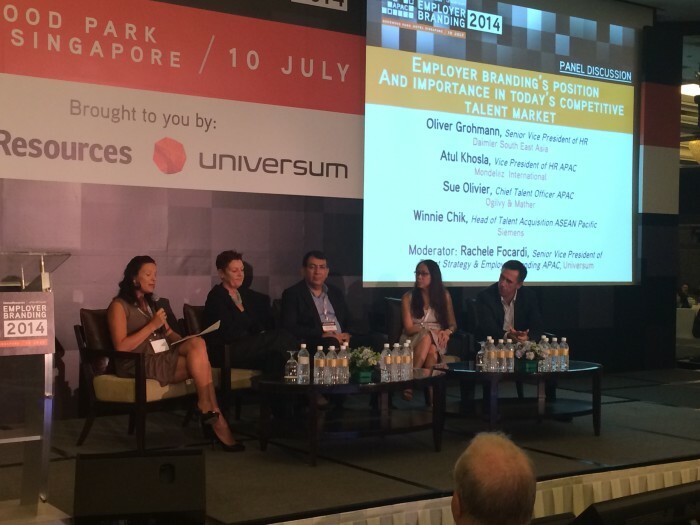 This was one of the key takeaways from Human Resources and Universum’s Employer Branding APAC 2014’s first panel on employer branding’s position and importance in today’s competitive talent market. “Everyone in Europe knows who Siemens is,” Winnie Chik, head of talent acquisition, ASEAN Pacific, Siemens said regarding the the difference in branding perspectives in various parts of the world. Oliver Grohmann, senior vice president of HR at Daimler South East Asia, agreed, explaining Daimler’s stronger presence in Germany as opposed to other countries and the need to develop that recognition across borders. Atul Khosla, vice president of HR APAC, Mondelēz International, whose company recently underwent a rebranding exercise, said it’s important to maintain strong branding when undergoing big changes. “Kraft was an established brand name. The opportunity was how to convert that transition into something positive,” he explained. Staying true and consistent to what the brand means to employees and what the company culture has become is integral to Khosla and his team. “It was important to be honest about what we are rather than being aspirational,” he added. But once you have established a brand, how do you get people to connect with it? Sue Olivier, chief talent officer at Ogilvy & Mather Asia Pacific, said this is crux of what branding means in her role. While using social media to develop such brand loyalty is an important tool, Olivier warned its importance should not be overestimated. “Social media is a given, and people are so connected today. But it’s bigger than that; it’s about having a brand profile. “If you’re not on the shopping list, no matter which media you use, you’re not going to be successful,” she explained. Stay tuned to LIVE updates from Employer Branding APAC 2014. Women with similar qualifications working the same jobs as men earn 2.7% less than their male counterparts. More here. ..